Difficult music, harsh electronics, spoken word, cut-up/collage and general CRESPAN© weirdness courtesy of: Aseptic Void and selections from Unexplained Sounds Group’s Oceans of Sound – Third Annual Report and Munster Records’ Invenciones: La Otra Vanguardia Musical En Latinoamerica 1976-1988. Thousands of Vancouver commuters ride the 99 B-Line bus route every day. But do you ever really listen to the sounds of the 99? Or are you constantly plugged in to your music, podcast, conversation or phone call? This piece is an uninterrupted audio experience of riding the 99 B-Line from UBC to Commercial-Broadway, as recorded from the very far back right-hand seat. Everything’s there, from waiting in the rain to the beeps of the compass cards to the driver coming over the intercom to remind people to step away from the doors. Think of it as an audio love-letter to public transit and the 99 — the bus we all love to hate. Microphone checks recorded in Calgary, Vancouver, Lytton, Iqaluit, Seattle, Istanbul, Kayseri, Erzincan, and Ankara, 2014-2017. Programmer asks google tiny questions, get’s big answers. A live reading from a 1963 broadcast series called “The Ultimate Science”; an educational lecture series on the history of biological life. 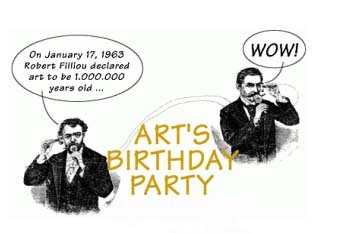 Happy Burthday Art, by Peter Courtemarche. From the creator of the Absolute Value of Insomnia comes a live stream of radio art in honour of Art’s birthday, which we celebrate today, January 17th. Difficult music, harsh electronics, spoken word, cut-up/collage and general CRESPAN© weirdness courtesy of: Lustmord and selections from Dur Unlash: Dark Experimental Music From Iran. Born in 1919, my grandmother recalls much of her life not as a person, but as a mother. As she approaches her 99th birthday I celebrate my 29th. In this short sound piece, I ask my grandma what she might be doing with her life if she were my age, in today’s world. Drawing from a mix of interviews, music and ambient tape, this piece explores how gendered oppression does not always equate to feminism and how feminism is more than a word. gak returns for his 7th go-round for one of his favourite days on the radio calendar, representing the Fluxists who created this day, along with a tribute to Mika Vainio (1963-2017), the Finnish experimental noise pioneer, late of Pan(a)sonic. Since its invention in the 1970s, voicemail has gone through a broad fluctuation in popularity. What was perhaps once seen as a convenient and time-saving function of the telephone is now massively regarded as an annoying and cumbersome way to get a message to someone. This is likely due in-part to the rise of text messaging as many people’s primary method of communication. But what have we lost in this shift? Is there any value to having small recorded pockets of someone’s voice, regardless of whether the message sent is inane or important? 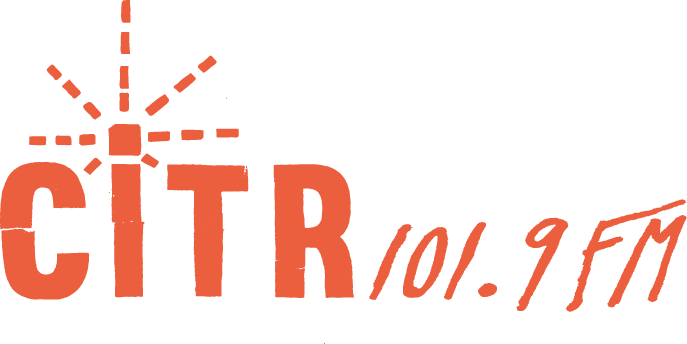 This piece is a collection of sounds and voicemails from the CiTR Radio and Discorder Magazine main office line, from 2016-2018. Jon Kew takes over for an hour and a half of… mystery. 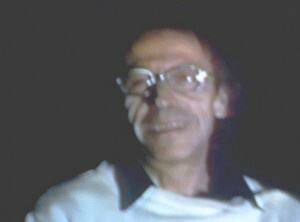 Peter Courtemarche, the man who started it all 30 years ago with Absolute Value of Insomnia. He will close out 24 hours of Radio Art with a live stream of experimental sound art. Podcasts up for 24 Hours of Radio Art! 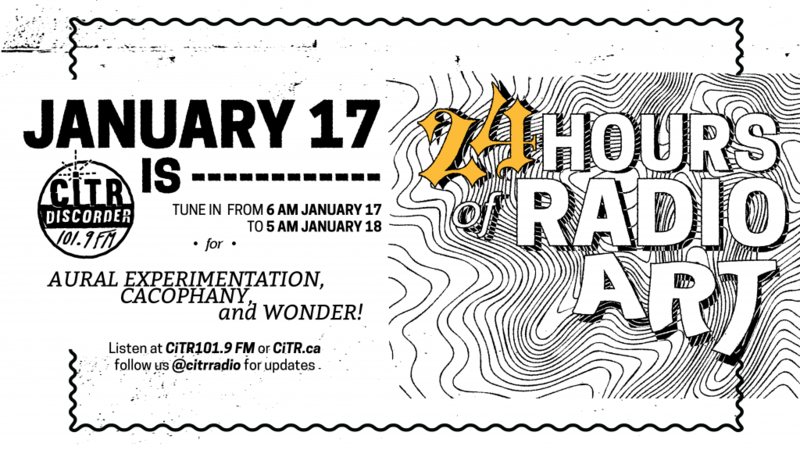 24 Hours of Radio Art is on Friday!